Taco is a traditional Mexican dish composed of a tortilla rolled or folded around a filling. A taco can be made with a corn or wheat tortilla and include a variety of fillings such as pork, beef, chicken, seafood, cheese, and vegetables. Tacos are often garnished with guacamole, salsa, avocado, tomatoes, lettuce, onions, or minced meat. They are usually eaten without utensils. Tacos became popular in the United States and Canada in the early 20th century. The most common taco variety in the U.S. is a hard-shell taco. It is a crisp-fried corn tortilla filled with meat, cheese, and vegetables. Hard-shell tacos are sold by many restaurants and fast food chains. They were popularized by Taco Bell. 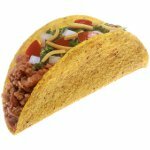 There also are other taco varieties such as soft-shell tacos, crispy tacos, puffy tacos and others. Tacos are very easy to cook at home because you can buy pre-made taco shells and fill them with whatever ingredients you like. If you are not fond of cooking even the easiest dishes, you can celebrate the National Taco Day by going out to your favorite taco place with your friends and family (the more the merrier).